No one can define the joy that a mother experiences when she feeds her baby. However, new mothers are often unaware of the signs that their child is hungry. They usually learn with time. However, their tiny tummies need to be fed very frequently. Mothers usually compare their own feeding schedule with their child. They think that their child is always hungry and may often want to curb this instinct in the baby as well. However, this is not correct. They have very small stomach and they will digest breast milk easily too. Moreover, the child is still growing and this is why he needs more nutrition. Feeding your baby 8 to 12 times a day is quite normal during the first few months. In this post, we will be talking about breastfeeding as well as the introduction of solid foods in their diet. Let’s explore all the topics one by one. More often than not, you will find that every baby has different feeding needs. Some babies consistently need to be fed throughout the day while cluster feeding during the evening is common to the rest. So you will have to invest some time in understanding your baby’s needs. Don’t get alarmed if your baby demands cluster feeding. This means that he would want to be fed a number of times within a few hours and stay quiet during the rest. That is completely normal. Moreover, as your child grows up, it would likely move away from cluster feeding. When you are using baby formula for your child, make sure that you are not using an excessive amount in the feeding. In general, a baby needs merely 1 to 2 ounces of baby formula in each feeding. Most babies will spit up if you use more formula. If such things happen, decrease the formula quantity in each feeding. However, in order to catch up with the nutrition, you might want to increase the number of feedings per day. Does a baby tell you that he is hungry? Putting the hands near the mouth mostly indicates that the baby is hungry. Some babies start turning their heads from one side to the other. The baby starts sucking on his clothes, toys, hands and may even start rooting. He may also start crying. Now, the question here is- what is the right frequency for feeding babies? In general, 8 to 12 times in a day is a normal feeding period. You can easily feed the baby every 2 hours. However, the American Academy of Pediatrics suggests that if the mother and baby have no problem with low milk supply and low weight, then it is always better to feed the baby based on hunger cues. This would avoid the chances of overfeeding and would make your child happy as well. This is true for breastfeeding children as well as babies who have started the solid food diet. The more you depend on his hunger cues, the better you will feed your child. Your baby’s appetite will change every day and also with every meal. Hence, do not make any pre-reservations about the feeding quantity of your child. He might eat more someday and not on the other. Keep a close watch on his hunger and you will always have a great feeding schedule to bank upon. If your baby is still breastfeeding and you want to keep a check on his diet, then make sure that you are keeping a tab on his diaper counts. Check the number of soiled and wet diapers each day and you will be able to determine if the baby is eating lesser than normal. Talk to your doctor regarding the optimum wet diaper count for your baby. Most of the babies start eating solid food when they are 6 months old. Your baby may take a couple of months more or less than that, depending on his growth. However, it is also a decision for parents to make. Some people start making their kids have baby cereal at 3 months of age while others might wait until their baby is at least 9 to 12 months of age. The American Academy of Pediatrics suggests that you breastfeed your baby for at least one year without using any formula or baby food. However, even if you start giving your baby solid food, do not stop breastfeeding him unless he is at least 12 months old. In fact, even if you want to breastfeed your child beyond the first year, you can do that as well. The WHO recommends that children should not be taken of breast milk for at least 2 years. It will be better to take cues from the baby. The babies who are ready for solid food often start showing interest in food. They would either look at other family members eating solid food or even start reaching out for it. 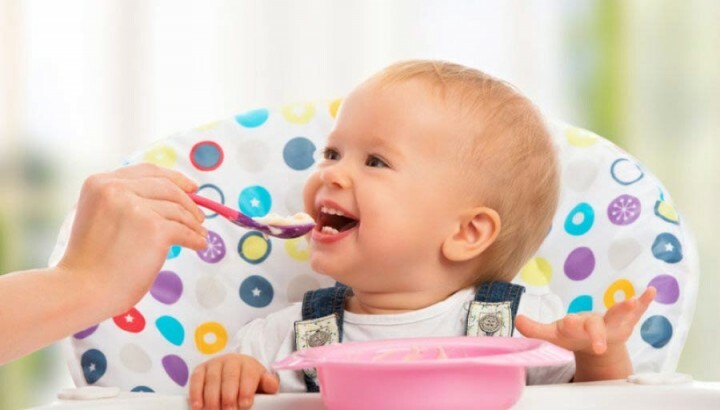 If your baby also does the same, then you should try giving him some pureed food and slowly introduce other kinds of foods to him. Remember, the kids would not start munching on solids right away. Be contempt with only one or two tablespoons in the beginning and take it from there. What could be my baby’s first foods? There could be many first foods for your baby. Most of the parents start with baby cereals. However, there are a number of first food options available for you now. Therefore, you can easily choose something that is fresher and healthier for your child. When you are shopping for your baby in the supermarket, you will often come across ‘Stage One’ baby food. This kind of food is usually meant for the babies that have just started having solid food. These foods are so thin that they will easily resemble breast milk. However, there are still many options for you to check out. Fruits can be a great first food choice for any baby. You should start out with bananas as they are easier to digest. Then include fruits like apples, apricots and even avocados in the diet. Prunes, pears, papaya, mango, peaches and even pumpkins can be a great choice for your baby’s first solid food. They are delicious and it is quite likely that your baby likes their taste. Here too, babies have their own likes and dislikes. However, giving fruits a try will always be helpful. Vegetables can also be a great choice for the first foods of your baby. Some experts recommend that using vegetables as first foods is usually better than fruits. This is because children get accustomed to the taste of the fruits and they might not like vegetables which cannot compete in terms of taste. The first vegetable for your child could be sweet potatoes and even peas. Use green beans and carrots as first foods. If you want to opt for grains, rice, barley and oatmeal should be chosen by you. You might wish to include meat in the baby’s diet as well. If yes, choose only pureed iron-rich chicken. Is homemade baby food safe? Yes, homemade baby food is completely safe for the child if you follow the basic rules. First of all, you have to avoid foods like spinach and turnip in the homemade baby food. They have a very high nitrate content and can be harmful for the baby. Use only the foods mentioned above to create baby food. Secondly, make sure that you have the appropriate tools and equipment for making baby food at home. When you decide to make baby food at home, a food processor will always be your first choice. Though you can easily mash bananas with a fork for your baby, some veggies and meats will certainly need a high powered processer for making a good puree. Here are some essential kitchen tools that you will need for making the perfect pureed food for your child. You should always started with a food processor or even a basic blender. They help in making a fine puree of all the foods which can easily be fed to the baby. However, you don’t have to put the veggies straight into the blender. For that you will need a steamer. A vegetable steamer will make the veggies softer so that they can be pureed in the blender with ease. A steamer with a tight lid is very essential as it helps in locking the nutritional content of the food while cooking. You will have to store your baby food for later use. In order to do this, you can buy specially made baby food freezing trays. However, this can also be done with the help of ice cube trays. No matter what you have, just keep the baby food in the container and cover it with a plastic wrap. It would become easier for you to store food in this way. You will also need ziplock bags for keeping your frozen food and also for labelling them properly. Use a permanent marker to mark the date on which the food was prepared and also write down the name or ingredients of the food. Remember, you should not use any baby food that was made more than a month ago. When needed, just thaw and heat the food and your baby will happily eat his solid food diet. These were some topics and ideas that should be covered when we are talking about baby food. Remember, it is always better to keep the food as fresh as possible and follow the cues of your baby when it comes to feeding time. It could be difficult for working mothers to take care of their children and feed them as per the hunger cues. In such a case, scheduled feeding will come in handy. Make sure that you are training your child to feed on a certain time. You can even opt for cluster feeding as this would help you balance your work and personal life. Don’t forget to keep a check on the diet and nutrition supplies of the baby. Don’t opt for a vitamin supplement unless it is absolutely necessary and has been advised by your pediatrician. The condition of the baby’s digestive health can easily be diagnosed through his stools. If they are too dry and hard, then it may signal constipation. Such issues are more common with babies who have started solid food diets. If your child is also experiencing the same, keep him hydrated in order to ease constipation. If you are unable to find the right cues from your baby related to his hunger, then talk to a doctor and sort out this problem. We would also like to warn you about introducing solid foods and finger foods too early in the diet of the child. Ideally, do not introduce any food other than breast milk to a baby’s diet unless he is 6 months old. Babies who start eating solid foods and finger foods sooner than this usually show signs of obesity and unhealthy appetite when they grow up. Hence, introduce solid foods only when you have had a talk with your doctor. In conclusion, we would advise you to closely monitor your child’s activities and even keep a record of his health. It would be of great help to your doctor if you keep a record of your baby’s health, especially his weight. By just checking the weight of your child, you will be able to track his health properly which would be great for him in the long run. Moreover, the doctor will also be able to make the correct diagnosis about his health. Happy feeding!